Two Finishes: Solid Color and MultiSpec - What's the Difference? Our pricing is based on refinishing in some variation of a white or off-white finish, but if you need a specific color, we can "special order" a variety of solid color finishes for an additional $75. If you don't need a special order color and are just trying to match the color to an existing toilet or countertop that is some variation of white or off-white, Jim has a great eye for color, and can tint the pure white color he starts off with to closely match the white or off-white color you're wanting. Please note that we do not refinish in dark colors. Why? Because even in the semi-sterile environment we try to create, there are still minute dust particles that float through the air that can easily be seen on a dark surface. We don't refinish countertops in solid color finishes for that same reason. For bathroom and kitchen countertops, we offer the hugely popular MultiSpec colors. 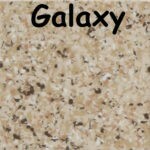 MultiSpec is a uniquely decorative coating consisting of individual flecks of various colors that are subtly blended to achieve the natural appearance of granite and stone (see Galaxy example). The reason we do not refinish countertops in a solid color is the same reason we don't refinish in dark colors as stated earlier ... because of the minuscule particles that float through the air during the refinishing process that can and do get permanently caught in the finish - which can and will be seen. Also, if you happen to chip the surface, it would be much more noticeable on a solid finish surface than it would be on a MultiSpec-finished surface.